Our showroom takes pride in offering the best selections to serve your home. Every piece of furniture, every accent, and lighting choice is an integral part of the design. This is why showroom at Angela Neel Interiors is proud to offer many vendors that are known for their design and quality. Among these is the company Woodbridge Furniture. This vendor offers many choices that are tailored to your unique style. Woodbridge Furniture is a high-end brand in the home furnishings marketplace offering case goods, dining, and occasional furniture. Woodbridge from its inception has focused on high-quality veneers and finishes combined with best in class construction. Founded in 2003, Woodbridge has been built on a reputation of classic lines and timeless pieces for today’s living. Woodbridge and its partners offer an integrated case goods business with custom paint and custom upholstery for the exacting needs of our customers. Whether you are looking for high-end or classic, Woodbridge is bound to have a piece to satisfy your needs. They feature high-end case goods, dining, and occasional furniture. There is also classic lines and timeless pieces you won’t want to miss. Their high-quality veneers and finishes granted the company the success they reached today. 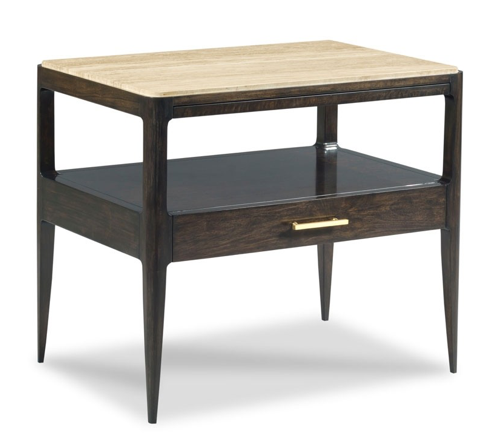 Check out this mezzanote bedside table pictured below. If you are looking to redesign your home or small space with custom furniture, Angela Neel Interiors knows just what you need. We offer several vendors that have various styles and designs that are sure to grab your attention, including the Woodbridge Furniture. Our showroom is the perfect place to touch and feel the fabrics and quality of our furnishings. Feel free to sit on furniture, compare swatches for upholstery projects, take note of the lighting and art pieces, and ask our interior decorators questions. We are here to guide you along the process of turning your space into a haven. If you desire to come into our store, we are open from 10:00 am – 6:00 pm Monday through Friday and Saturday 11:00 am — 5:00 pm, or give us a call today!